Don’t let the title fool you. I am not that kind of Doctor. The sight of blood, particularly my own, makes me swoon. I can usually keep it together long enough, however, to deal with a crisis – cuts, gashes, stitches…etc. I guess its the mother/nurturer in me. Amongst our menagerie of critters, we have three dogs one, of whom, has entered his twilight years. My husband comes from a farming background; born and raised on a family farm west of Saskatoon, Saskatchewan. When it comes to animals, he takes a very practicable approach. In terms of veterinary services, he assesses the prospective costs against what he perceives to be the overall value of the animal in question. He advocates for care as needed but will only invest so much. In other words, thousands won’t be spent to save the life of any of our much beloved family pets (except, perhaps, in the case of our horses). I am sure that some of you animal lovers out there are clucking your tongues and have PETA on speed dial. These are the realities of rural living and I don’t think that our family strategy is much different than many others’ out there. Rocky, our 14 year old terrier cross, is at an even further disadvantage. Given his advancing age, we have made the decision not to take any extraordinary measures to save his life or to even invest an iota of money in any veterinary services on behalf of his care should something unforeseen happen. Rocky is a bit of a ‘case’. He’s old, cranky (some say ‘unattractive’ but I would argue otherwise) and antisocial. 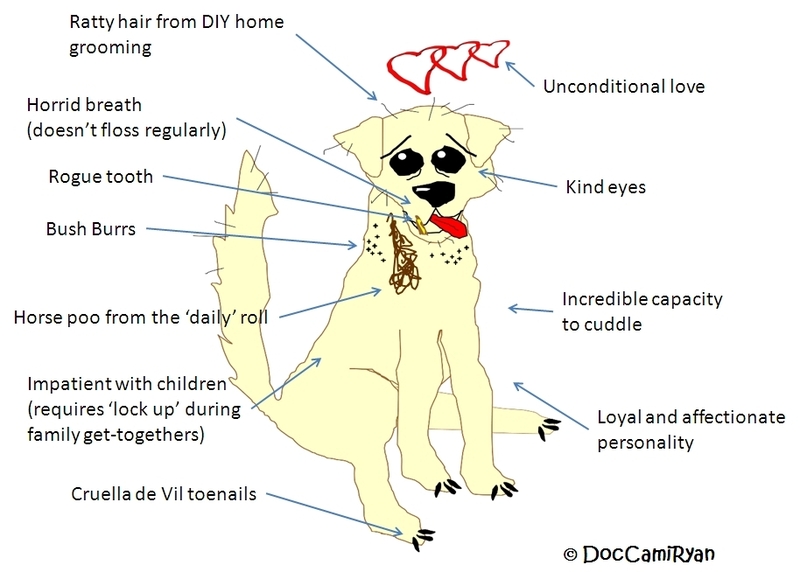 These characteristics have gotten him kicked out of every dog grooming establishment in the Okotoks area. Rocky is not welcome and we are forced to act as groomers. So, now he is an old, cranky, antisocial dog with a bad haircut. And, yes, that doesn’t up his ‘attraction’ factor. I was out moving horses from the pasture to the paddock one day this summer. Rocky (and Reba and Charlie) – as helpful as always – were running around barking and nipping at hocks. This is always a recipe for disaster. I heard a loud yelp and saw Rocky skitter away from between our quarter horse’s legs. He limped pathetically towards the barn, gingerly holding his front paw up. Hmmmm…. not good. Once I got the horses in, I took a look. There was a gash approximately 2.5 inches long on his front paw. Although the main bones of his leg seemed to be intact, I suspected that his paw might have been broken as it was very tender to the touch. I also knew that we weren’t going to spend upward of $1000+ to fix this mess, so I got innovative. I took Rocky into the house and cleansed his wound and shaved the area to the best of my ability. I coated the wound with Polysporin and wrapped it with a mini pad and gauze. Once this was done, I needed to stabilize his foot. My hope was, that in doing so, his appendage, if broken, would heal to a point where he could at least still make some use of it. How was I going to ‘splint’ this? Aha! I grabbed an empty toilet paper roll and slid it over Rocky’s leg. 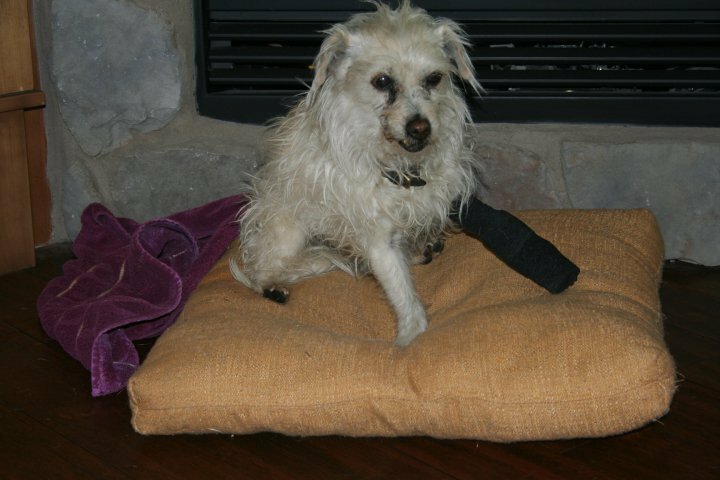 To keep it in place, I wound vet wrap around the makeshift splint and up Rocky’s leg. Voilà! Worked like a charm! Long story, short – Rocky survived the trauma and my DIY veterinary method (repeated twice daily) worked well. It took about a month but the old man walks without a limp. He’s still old, cranky and antisocial though. — Thomas J. Peters and Robert H. Waterman, Jr.